GET A COPY OF OUR NEW BOOK! 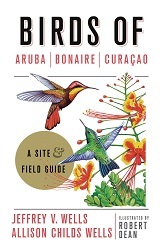 Reading about the experiences of others who birded Aruba may help you in planning your own trip! Select the date of the report you'd like to read. August 2010 - John W.
July 2010 - Bob v.
May 5, 2010 - Bob T.
Dec 2007 - Rick S.
Jan 2007 - Alanna L.
Dec 2006 - Lisa of Aruba Bound! Nov 2006 - Rick S.
Sept 2006 - Lisa of ArubaBound!